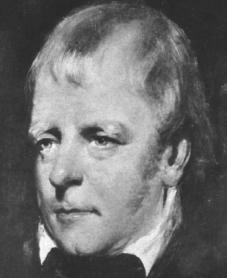 The Scottish novelist and poet Sir Walter Scott is recognized as the master of the historical novel. He was one of the most influential authors of modern times. Walter Scott was born in Edinburgh, Scotland, on August 15, 1771, the son of a lawyer with a long family tradition in law. By birth Scott was connected with both the rising middle class of Britain and the aristocratic (ruling class) Scottish heritage then passing into history. As a child, Scott battled polio, a disease that attacks children and impairs their development. Despite the ailment, Scott did enjoy a relatively active and happy childhood. During these years he developed a deep interest in literature and reading, especially the folk tales and legends of his native Scotland. Scott was educated at Edinburgh University and prepared for a career in law, but his true passions lay in history and literature. During his years at the university, he read widely in English and Continental literatures, particularly medieval and Renaissance romances from the fourteenth to seventeenth centuries. He also enjoyed German romantic poetry and fiction, and the narrative folk poems known as ballads. J. W. von Goethe's (1749–1832) play Götz von Berlichingen (1799) and other translations from German; Minstrelsy of the Scottish Border (1802–1803), a collection of ballads that generated great interest in folk poetry; and a succession of narrative poems, mainly of historical action. These poems—including The Lay of the Last Minstrel (1805), Marmion (1808), and The Lady of the Lake (1810)—became best sellers, and Scott established his first literary reputation as a poet of the romantic school, an artistic movement developed in the eighteenth and nineteenth centuries. During these years Scott also pursued a legal career, rising to the official position of clerk of the Court of Session. His enormous energies allowed him to engage in scholarly and journalistic activities. His edition and biography of John Dryden (1631–1700), the English poet and dramatist, published in 1808, remains of value. His politically motivated founding of the Quarterly Review, a literary journal, helped make Edinburgh the most influential center of British intellectual life outside London. In these years Scott also began to create an estate, Abbotsford. He modeled its furnishings and architecture on the traditions of the medieval era (c. 470– 1470 C.E. , also known as the Middle Ages). When sales of Scott's verse narrative Rokeby (1813) declined and a new poet, Lord Byron (1788–1824), appeared on the literary scene, Scott began to develop another of his many talents. Picking up the fragment of a novel he had begun in 1805, he tried his hand at fiction, and his most fully characteristic novel, Waverley (1814), resulted. As its subtitle, 'Tis Sixty Years Since, established, Waverley was a historical novel about the 1745 rebellion to restore the Stuart line to the British throne. By leading a young and foolish Englishman through a wide range of Scottish classes, political factions (rival groups), and cultural modes, Scott built up a substantial picture of an entire nation's life at a dramatic historical period. The success of Waverley established Scott in the career of a novelist, but it did not establish his name in that role. Unwilling to invest his career in fiction, he had published Waverley anonymously (without the author's name). Finding that the mask of anonymity had stimulated public interest, Scott signed his later novels "by the Author of Waverley." This signature became his trademark, the novels bearing it being called the "Waverley" novels. The Waverley novels exercised enormous fascination not only for Scots and Englishmen but also throughout Europe. These novels provided the characters and plots for countless stories, plays, and operas, the most famous of which is Gaetano Donizetti's (1797–1848) opera Lucia di Lammermoor. Scott's achievement as a novelist can best be summarized by grouping his novels according to their topics and settings. His first successes were largely in the realm of Scottish history. In the order of their chronological setting (date in which the story takes place), the Scottish novels are Castle Dangerous (1832) and The Fair Maid of Perth (1828), both set in the fourteenth century; The Monastery and its sequel The Abbot (both 1820), set during the sixteenth century's religious upheavals; A Legend of Montrose (1819) and Old Mortality (1816), which deal with the campaigns of the seventeenth-century civil wars; and a series of novels of the Jacobite (Stuart) rebellions of the eighteenth century— Rob Roy (1817), Waverley, and Redgauntlet (1824). Other Scottish novels indirectly related to historical themes are The Black Dwarf (1816), The Heart of Midlothian (1818), The Bride of Lammermoor (1819), and The Pirate (1822). Scott also wrote a group of novels set in his own times: Guy Mannering (1815), The Antiquary (1816), and St. Ronan's Well (1824). Scott, at a critical point of his career, turned to English history for his subject matter. Critics generally agree that the English (and Continental—those of Europe) novels, mainly set in medieval times, are inferior, but they include Scott's most lasting popular works. He began with Ivanhoe (1820) and then wrote three other novels set in the period of the Crusades: The Talisman (1825), The Betrothed (1825), and Count Robert of Paris (1832). Quentin Durward (1823) and Anne of Geierstein (1829) deal with the later Middle Ages, and the Renaissance is represented by Kenilworth (1821) and The Fortunes of Nigel (1822). So massive a literary output cannot be reduced to broad generalizations. Most critics and readers seem to prefer Scott's early novels. On the whole, Scott's work is flawed by overly emotional writing, but his novels command the power to put modern readers in touch with men of the past. Scott's later years were clouded by illness, throughout which he continued to write. He spent the energies of his last years trying to write enough to recover honorably from the bankruptcy of a publishing firm in which he had invested heavily. He died in Abbotsford, Scotland, on September 21, 1832. Lockhart, J. G. Life of Sir Walter Scott. New York, T. Y. Crowell & Co., 1870. Reprint, New York: AMS Press, 1983. Sutherland, John. The Life of Walter Scott: A Critical Biography. Cambridge, MA: Blackwell, 1995. Todd, William B., and Ann Bowden. Sir Walter Scott: A Bibliographical History, 1796–1832. New Castle, DE: Oak Knoll Press, 1998.